The PT100 and PT1000 sensors consist of a platinum wire whose resistance is 100 ohms at 0°C (PT100) and 1000 ohms at 0°C (PT1000). With a temperature change, this resistance changes precisely and extremely linearly. It is measured with high-precision measuring instruments and displayed a s a temperature value. Suitable measuring instruments or data loggers must be designed for the connection of PT100 or PT1000 probes. The platinum sensors comply with international standards such as e.g. IEC 751 / DIN EN 60 751. Due to their small limit deviations, they are commonly interchangeable without the need of recalibration of the sensors. 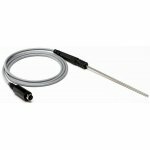 The standard covers the temperature range from -200°C to +850°C, although the real application range of the sensors is usually narrower and specified in the technical data.